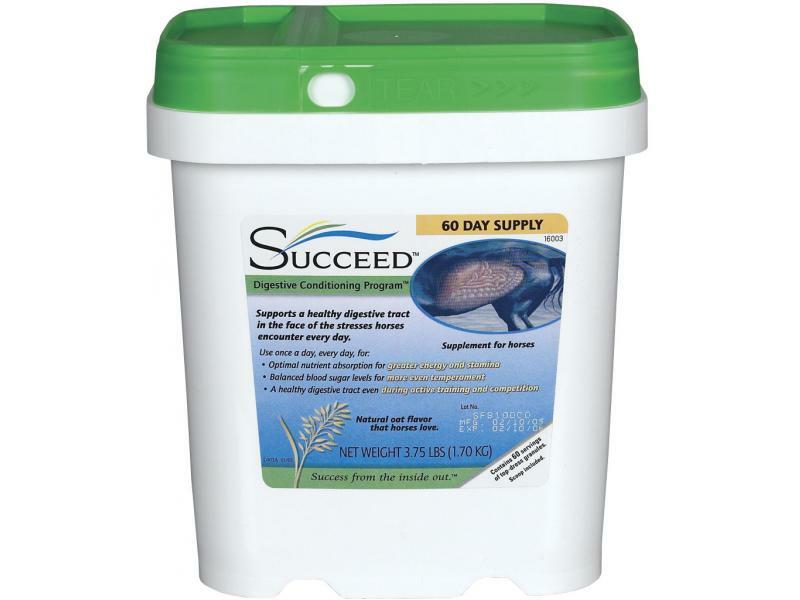 By feeding SUCCEED® digestive supplement for horses once a day, every day, you have a daily conditioning program for the inside of the horse to get better results on the outside. SUCCEED® gets to the root causes. It’s a natural system of key nutrients that can offset the underlying digestive imbalance that can result in the face of challenges modern horses face every day. 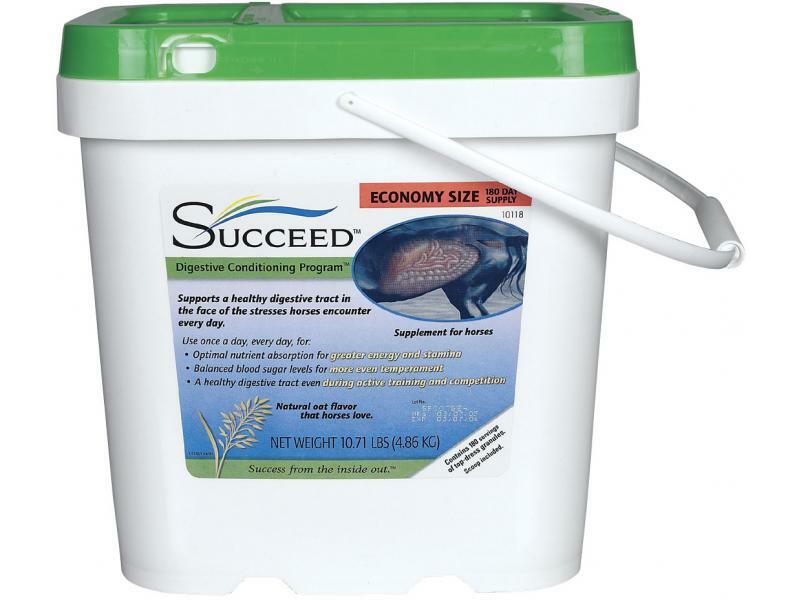 The nutrients in the SUCCEED® patented formula occur naturally in the horse’s diet, or are naturally synthesized by the body. But these nutrients are often in short supply for the modern performance horse, where the rigors of training and lifestyle, and energy requirements, are all the greater. Feed SUCCEED twice each day for the first week to 10 days of use, to condition the system. Always feed SUCCEED with the same feeding each day (e.g., with morning or evening feeding). If you top dress with SUCCEED, do not leave SUCCEED exposed to air for more than 30 minutes, as this may reduce its appeal to the horse. Oral Paste: Simply empty the contents of one oral syringe directly into the horse’s mouth, once each day immediately before feeding. As an alternative, you may squeeze the contents of the tube directly on to the horse’s feed as a top dressing. 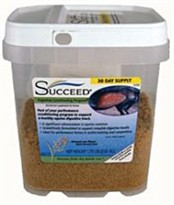 Granules: Just one scoop of SUCCEED granules (27 grams), applied directly on top of feed once each day, and you’re done. No mixing. No adding other ingredients. Oat Oil: Oat oil in SUCCEED® contains a high concentration of polar lipids, which strengthen the tight junctions between enterocytes, the intestinal cells responsible for nutrient absorption. This has been shown to improve nutrient absorption. Oat Flour: Oat flour in SUCCEED® is rich in Beta glucan, a soluble fibre. Beta glucan is a powerful stimulant to the immune system. It also helps normalise the rate at which food passes through the digestive tract, which is necessary for optimal nutrient absorption and to help prevent undigested starch from reaching the hindgut. Also, the moderated release of sugars into the bloodstream helps prevent sugar highs and lows that can affect your horse’s temperament. 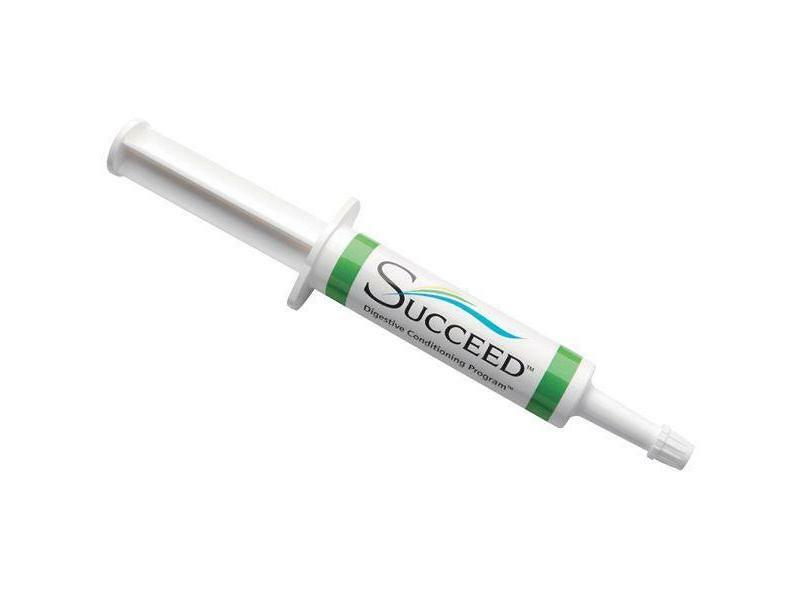 Irradiated Dried Yeast: The irradiated dried yeast products in SUCCEED® include two forms of Mannan oligosaccharide (MOS), a complex yeast sugar. One form of MOS acts as a sponge that traps harmful pathogens in the gut so that they can be excreted safely. The other binds to fungal-based pathogens, called mycotoxins, so they are safely eliminated from the body. Nucleotides in yeast support cell reproduction and enhance the growth of intestinal cells. Glutamine: Glutamine is an amino acid that provides fuel to muscles. It also helps strengthen and lengthen intestinal villi, the ripples responsible for nutrient absorption. Threonine: Threonine is another essential amino acid that supports the production of mucin, a necessary component of mucus that lubricates and protects the GI tract lining. Below are some recent questions we've received regarding Succeed Digestive Conditioning Program for Horses, including answers from our team. I have treated my racehorse with Gastro Gard and now I want to give Succeed. Do I have a problem when the horse go to race? No, this is not a problem. GastGard and Succeed are both competition legal. Do you feed the same amount to a pony as a horse ? If your pony is 250kg or less you can feed half the suggested serving. If your pony is over 250kg I would feed the same amount as is suggested for a horse. Gastric ulcers are normally best treated with a prescription product your vet can advise you on. The manufacturer of Succeed claim that it will help and that might well be true, but there is not much scientific support for this view that I am aware of. This product might well help to some extent, but it is difficult to be sure.